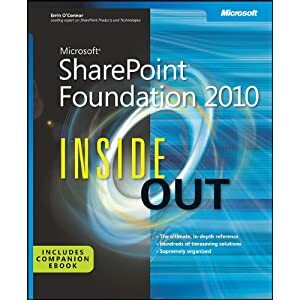 I’ve agreed to contribute to the upcoming Microsoft Press title Microsoft SharePoint Foundation 2010 Inside Out. Amazon has already updated the listing with me as co-author. How exciting! I’ve already started writing the first chapter I’ll contribute which is tentatively titled “Administration for Business Users.” I have what I think is a unique concept for the chapter. 99% of SharePoint users will never install SharePoint, but many will want to know how the decisions made by engineers will effect their SharePoint site. What do you think about the advanced business user’s interest in administration? I believe the audience of this book won’t want to perform the install, but they will want to make sure the install is performed correctly. Tom, does this mean you’ll be at the book signing at #SPC11? Would really want to have YOUR sig on my copy. If there’s a book signing, I’ll be there. Thanks for the compliment and for the #SPC11 content on your blog.